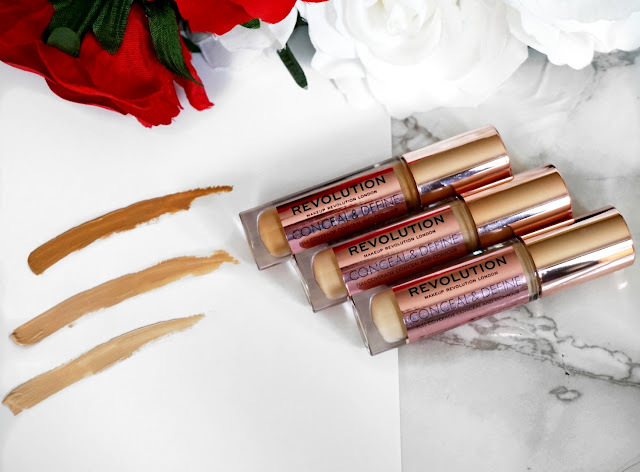 It's no secret that I do enjoy testing Makeup Revolution cosmetics, mainly because they DO NOT BREAK THE PIGGY BANK and they produce excellent high quality ranges. The Queen of all concealers has been the TARTE SHAPE TAPE CONCEALER by Tarte Cosmetics. All beauty gurus have sworn by this formula. The internet has stated that this could well be it's dupe. This product retails at £4. It's insane, ONLY £4 ?????????????????? Is this even real? It can't possibly be any good? or can it? I had to try it and let you know if our top influencers were either over hyping the product or ACTUALLY enlightening us on a great concealer! I do advise if you get a chance to purchase it in store only because it's best to test the colour you may need on your skin. They seem to cater to a great range of skin tones but mainly with warm undertones. This concealer may well be very versatile to ALL SKIN TONES as it exhibits 18 Shades in different undertones. The undertones include cool, neutral and warm undertones. I did find that there are huge differences in shades and tones between each one. Hence, there is no gradual tone change from one shade to another. The shades and tones DO NOT change consistently in increasing darker pigmentation but rather fluctuate between pink, yellow and brown diverse undertones. I HIGHLY RECOMMEND PURCHASING IT IN STORE. "This particular range was produced not only as a concealer but also for possible contouring hence the CONCEAL & DEFINE name." As you can see there is only 1 shade difference between the shade I chose for the concealing affect and the foundation effect. This is due to the factor I mentioned, there are some jumps in colour. I did find that these shades were perfect for my skin colour and undertone. 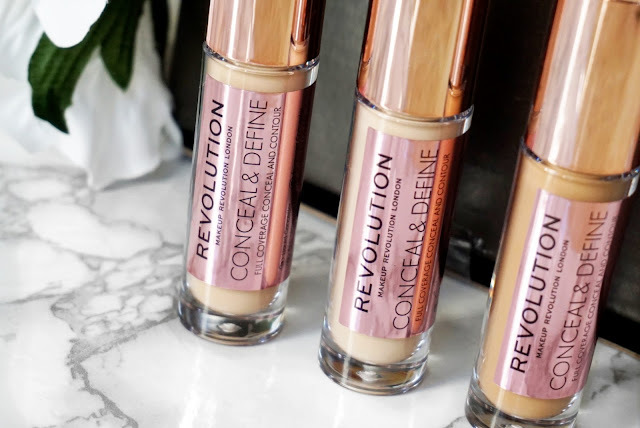 They are soon to release foundations sticks which I am excited to test out. I was excited to see that they had a large angled applicator tip which makes application very comfortable. The concealer is retained well and applies well through the wand. Below you can see the similarity between these two very efficient wands, the Tarte Shape Tape VERSUS the Conceal & Define by Makeup Revolution. I always tread carefully when it comes to endorsed recommendations as I cannot verify them unless I try the product myself. The formula they devised is lightweight but thankfully full coverage and has a matte finish. It did cover blemishes, redness and my slight dark circles very efficiently. With a sponge it blended very easily. I COULDN'T GET OVER HOW EASY IT WAS TO WORK WITH. You can even build the product up if needed. YES!!!!!!!!!!!!! You really can! Super coverage! C7 was applied as I would for my foundation and buffed with a sponge. Subsequently, applying C6 on the areas that need concealing and again with a sponge blended it in. 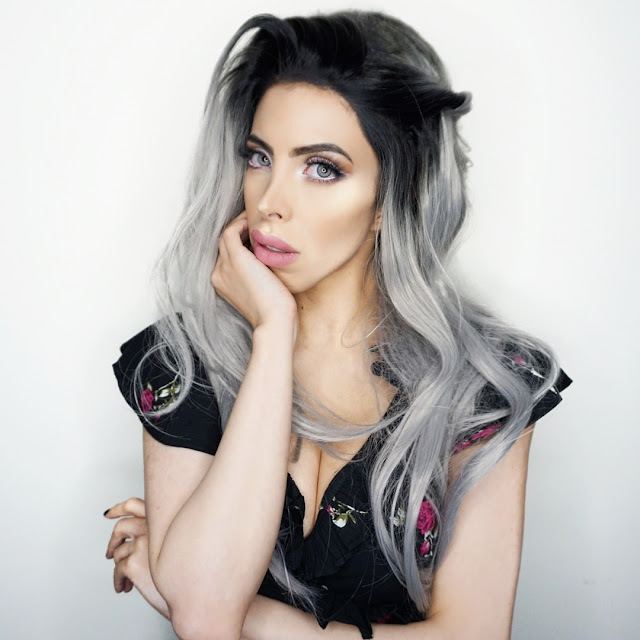 I LOVED C12 and used it to contour my face, It just looked perfect and truly defined my features beautifully. BAKE & FINISH by Makeup Revolution was used to set the concealer in place and avoid possible setting of it into lines. Using the same brand setting powder is important as usually they work well together. The picture below is created with the conceal and define. I used C7 as the foundation colour, C6 as a concealer and C12 as a the contour. I love how flawless and well put together it looks. I would never guess the concealers were only £4!!!!!! A high quality bargain I would say. I have devised a video to showcase the application process and finished look. Can you see how well it covers up redness and imperfections? I am incredibly impressed. Makeup Revolution has knocked the ball out of the park with this one. 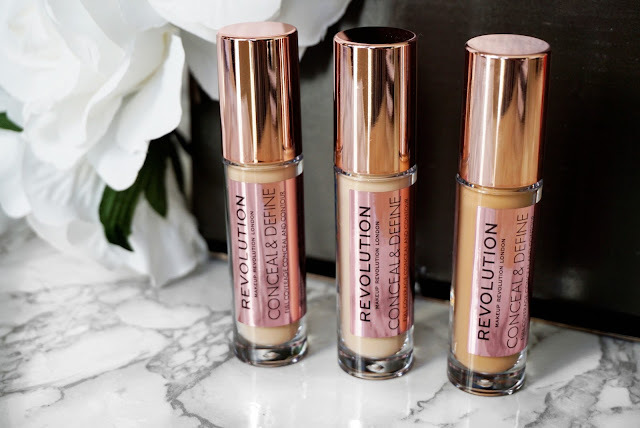 This is a great contender for the best concealers out there. My finish was honestly flawless. How can a £4 product do so well?????????????????? The concealer does NOT move, cake and stays put for up to 12 hours. It did slightly cling to dry skin and set in some lines so if you have very dry skin do prep your skin with oil and make sure you set it with powder to avoid this. I assume that it has this small draw back for two particular reasons, one being that it is MATTE in consistency and other being how you apply it. It is empirical you follow the correct application methods to avoid these faux pas. For such a low price point it did beyond my expectations. If you use this product efficiently it is a force to be reckoned with. CONCEAL & DEFINE welcome to our lives and my daily makeup routine. 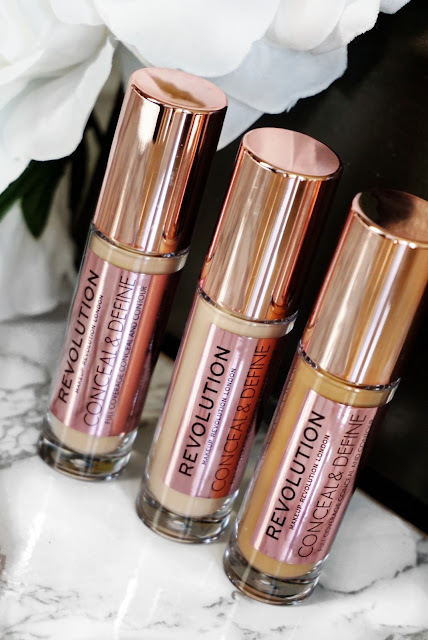 A round of applause for Makeup Revolution's innovative product launch and for creating affordable products which are high in quality. 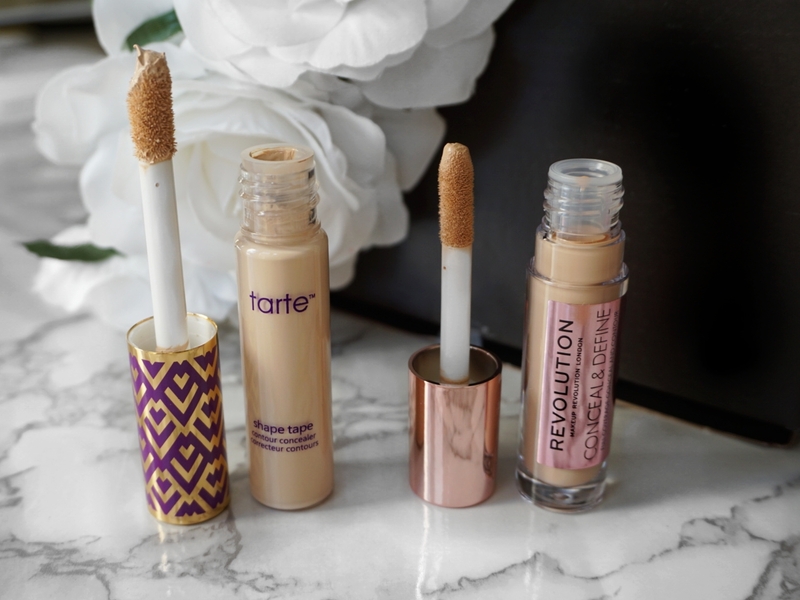 I will soon put TARTE SHAPE to the test against CONCEAL & DEFINE, so keep your eyes peeled. LET ME KNOW YOUR THOUGHTS BELOW, HAVE YOU TRIED IT? ARE YOU SOLD ON IT?